Description: like many of Hasbro’s medium sized dinosaur models, this electronic Tyrannosaurus doesn’t stand in a neutral posture. It's posed in a bent position, head, arms and tail positioned to the right, as if circling potential prey. It has a large dino damage wound on its right flank, revealing red muscle tissue. Inside this wound a button is located: when pushed it activates a rather high pitched growl. A second button is placed on its throat. Pressing this button produces a fierce attack roar, and makes the jaws open. Both the arms and legs are fully poseable. This T-Rex is mostly coloured light brown, which is found on the head, neck, back, upper arms, most of the legs and top part of the tail. Its underside (throat, belly and front half of the lower part of the tail) is painted white. In-between these brown and white colours, a sickly greenish brown colour is found, most notable on the flanks. This colour also covers most of the arms and lower jaw, the feet and the inner part of the lower legs. On the head, neck, back, tail and upper legs, black spots and shapes of various sizes cover the light brown colouring in a random pattern. The tongue and inside of the mouth are painted pink, while the animal sports white teeth, small red eyes with black pupils and black claws on both fingers and toes. A white JP logo is found on both upper legs. The Triceratops appears to stand in a brace-for-impact posture (and rightly so! ), its head (almost as big as its torso) held low to the ground, and slightly posed to its right, the front legs more or less in the same position, while the left upper leg is stretched backwards. The tail curves to the right. Its paint job is rather straightforward: underside (belly, most of the tail and legs and throat), as well as parts of the neck shield, beak, cheek horns and nose horn, painted brown, while the back, first half of the top part of the tail and top parts of the legs are coloured dark brown. Most of the face is also coloured dark brown, giving the impression the Trike is wearing a mask. The two horns above the eyes (which themselves are painted light blue with yellow pupils of all things!) are painted a shinier hue of the light brown colouring. The creature carries a white JP logo on both upper hind legs. Analysis: this Rex again? Yes, indeed, but this time in the company of the “new” small Triceratops sculpt a lot of JP toy fans have speculated over many hours during the long winter nights, so despite the avid repainting in this line there's still at least one thing of interest in this particular set. The Trike is a decent though overly simple figure and has a paint job to match, which in fact looks just boring (making the specimen from the Triceratops/Tyrannosaurus two-pack of this line look far better considering it has a more original paint job). The Trike's eyes however, feature a unique colour scheme for JP dinosaur figure's standards, but the result looks too odd to be taken seriously. And apart from that, the poor critter is just lunch to the much bigger Tyrant Lizard King, who is of course supposed to be the main draw of this set. The T-Rex also has a paint job of little appeal, one very reminiscent of many past figures' paint jobs, clearly done by an uninspired painter who didn't think originality would be appreciated on a sculpt already repainted twice before. Most of the details, like claws and the mouth, have been taken care of, but the dino damage wound, which clearly shows ribs sticking out, is painted red only, which is rather disappointing. Otherwise the T-Rex sculpt is still okay, though the posture it assumes hinders playability and the biting action should have been easier to access than pushing the creature's throat. The sounds remain the same as before, though it seems the electronics used this time around are even weaker then before considering most JPD2/3 electronic dinosaurs are dead by now in that regard, even when still boxed. Repaint: yes. 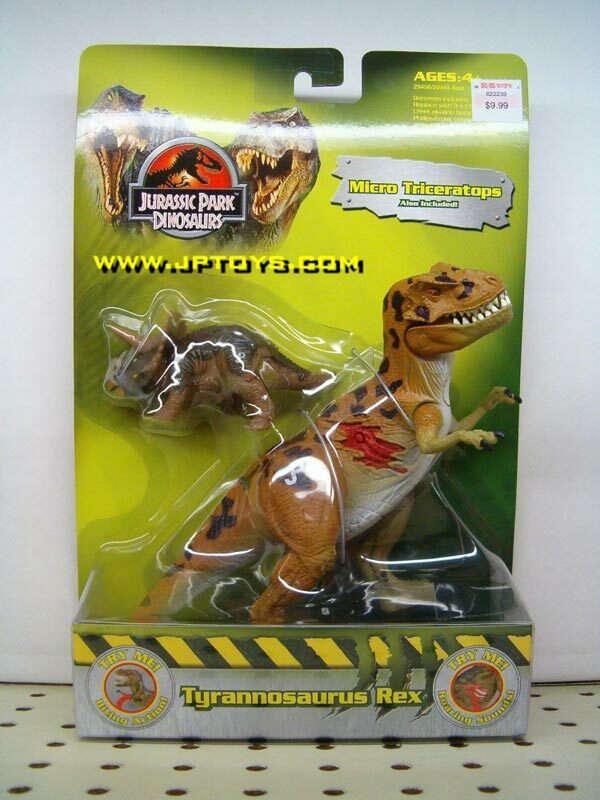 The Rex was originally released in the JP III line. It has been repainted before for Camo-Xtreme and JPD2 and would also be featured in JP 2009. The Triceratops first appeared in this toy line, but is very likely a leftover from the JP III line since it's hard to imagine Hasbro bothering to create a single new sculpt for a line which otherwise consists entirely of repaints. The little Trike can also be found in the JPD3 Triceratops/T-Rex two-pack. Like the Rex, it would be seen again in JP 2009. Overall rating: 6/10. The mystery Triceratops pops up a second time in this line! Its appearance alone makes this set more interesting, but neither sculpt is that appealing and both are adorned with dull and uninspired paint jobs. Like the other JPD2/3 electronic dinosaur figures, this two-pack was very common a few years ago, but has since become much harder to find, despite not being a very popular set (though the Triceratops might make this set more interesting to collectors who don't own that sculpt yet). If you really want one, patience is certainly required, though it doesn't necessarily require a lot of cash once you've found it.